Can I renew my floating licenses via Link? Unfortunately, no. Please contact sales@redgiant.com to get the renewal process going. I’m seeing the red X with “All Volume Licenses are currently in use” or “Licensed using serial number”. What can I do? Check that all licenses aren’t in use. Open the RLM GUI, click ‘Status’, then click the ‘redgiant’ button under ‘server status’. Look at ‘count’ vs ‘inuse’. If you aren’t seeing anything under “License Pool Status”, check to make sure the server license file is in the correct location, and that the licenses haven’t expired. I’m seeing the red X on some of my frames after a render… What can I do? Final Cut Pro X: Head into File > Delete Generated Event Files. Premiere: Head into Sequence > Delete Render Files. After Effects: Head into Edit > Purge > All Memory & Disk Cache. I’m seeing a message about a 14 day trial when applying an effect / I’m seeing the following screen. Check to make sure the latest version of the effect used is installed. If it is not, download the latest installers and reinstall. How can I create server log files? 4. This will generate a file named “rlmdiag.txt” at the root of the server (Macintosh HD/C:) by default. How can I create client log files? 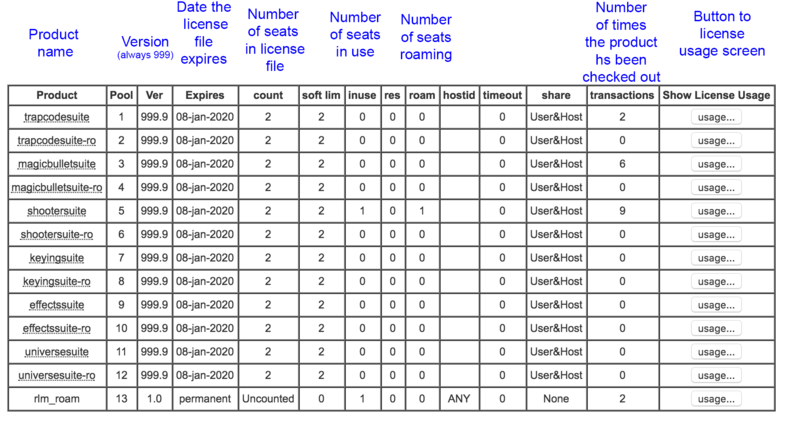 How do I remove all old serialization files from my machine? Make sure all host applications are closed before starting this process. 1) Remove registration files from the system’s registry Note that files might not be installed for all locations shown below. These registry files may need to be removed for each admin/user account they were installed for, which will require logging into each account to remove these files. Open your Start Menu and type “regedit” in Search and hit Enter. Check the “RedGiant\Volume” and “RedGiant\Licenses” folders for registration files and delete them if found. Delete any “com.redgiantsoftware” .plist files from this location. It helps to sort the folder by Name to spot all of them. With your Finder window still active, open the Go menu, select Go to Folder…, and paste in this filepath: `/Users/Shared/Red Giant/.prefs` If it kicks back an error and doesn’t take you to a folder, skip the next step. Again, remove any “com.redgiantsoftware” .plist files from this location as well. My client machine can’t check out licenses, what do I do? Where is the Trapcode scripted installer? The download link just has the regular installer. Link shows my plugins as “trial”, will I see issues when using an RLM license server? No, you should be able to use your products normally within the host application. Seeing Link say “Trial” is normal. Make sure that “localhost” is the IP (or hostname) of your server. I’m not seeing any licenses populated in my ISV pool, what can I do? Make sure the .lic file is the most up-to-date one Red Giant has sent you. How do I update license files for hardware upgrades? Contact volumesupport@redgiant.com with the new server information and we’ll be happy to provide a new license package. Can I see the history of my floating license purchases when I sign into Redgiant.com? Unfortunately, no. Contact your sales representative for information on past purchases. I’m not seeing any log files created, what do I do? How do I make sure a license was checked out correctly? Click ‘Status’, then under ‘Server Status’ you’ll see a ‘redgiant’ button. Click that. Try applying a Red Giant effect and observe this number changing. How do I see a log of past license checkouts? I can’t check out a license from my failover server. What do I do? Make sure the primary isn’t running. Clients will be unable to checkout licenses from the failover while the primary is running. In the instructions the drive name is ‘Macintosh HD’. Does my drive have to have the same name? No, any name of your disk drive should be fine. Where do I download the RLM server program? https://www.redgiant.com/volume/tech-files/ has the download links for both Mac and Windows RLM installers. How do I add render only licenses to my license package? Contact your sales representative and we’ll get a new license package to you as soon as we can. What does all the information under the ‘License Pool Status’ mean? What are the system requirements for the RLM server software? The RLM executable takes up about 1.2 MB of disk space and is supported by the following platforms. How do I apply a Red Giant effect to make sure it’s licensed? Drag the newly created Solid from the Project panel into your After Effects composition, adjusting it to whatever length you’d like your effect to be. In After Effects, with your solid selected, head into Effect > (Your Red Giant Suite) > (Red Giant Effect). After applying the effect, make sure there is no watermark (red X) on the media. Click the “Licensing…” option in the Effect Controls to make sure the product is “Volume Licensed”. Can a server on a Mac send licenses to a Windows machine or vice versa? Yes, the RLM server software can issue licenses across operating systems. How do I upgrade my purchased suites? Installing an upgrade is the same process as installing any of our other products or plugins. You do not need to uninstall your previous version and a previous version does not need to have been installed prior to installing an upgrade. 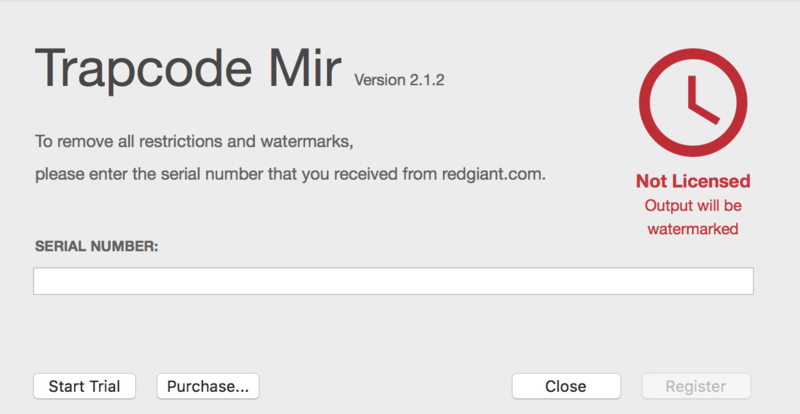 Installers for the latest versions of Red Giant suites can be found on the Tech Files page here. Who do I contact for support as a Volume Customer? volumesupport@redgiant.com will get you in touch with our Volume support team.